Driving is supposed to be fun. It’s not supposed to just be a way to get from point A to point B. Driving is supposed to awaken something inside everyone, a sense of adventure and freedom. Mazda understands the special feeling and bond that can come from driving a special car, which is why they put so much effort and detail into the new 2019 Mazda MX-5 Miata. The MX-5 Miata soft-top and hard-top models are the resident sports cars in Mazda's lineup, and they are here to put the fun back into your driving experience. If you’re looking for a new car to spice up your driving, then you can’t do any better than the 2019 Mazda MX-5 Miata RF. If you’re looking to learn more about the widely-popular sports car, you’ve come to the right place! For this model research page, we’re going to go in-depth into everything drivers need to know about the 2019 Mazda MX-5 Miata from its performance to its interior and more. 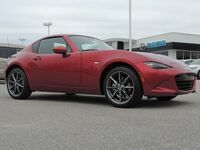 Test Drive the 2019 Mazda MX Miata RF at Medlin Mazda near Rocky Mount, North Carolina, Today! The 2019 Mazda MX-5 Miata RF is a sports car, so there’s no better place to start than underneath the hood. Continuing the tradition of exciting, small sports cars with plenty of zip behind them, the 2019 Mazda MX-5 Miata has been updated to become the most powerful two-seater ever made by Mazda. The 2019 Mazda MX-5 Miata’s SKYACTIV-G 2.0-liter 4-cylinder has been re-engineered so that now it can generate up to 181 horsepower with a redline of 7,500 rpm. It’s not the biggest engine but believe us when we say it can pack a punch! On the inside, drivers will find the elegant quality and refined excellence they’ve come to expect from Mazda cars. The two-seater obviously isn’t the biggest car, but it isn’t cramped either, affording plenty of room to both the driver and passenger without encumbering the 2019 Mazda MX-5 Miata’s sleek look. To put it plainly, it fits like a glove. Of course, there’s the 2019 Mazda MX-5 Miata RF’s hard-top roof tuck, which can transform the two-seater into a convertible in just 13 seconds. Plus, the concealed engineering means the roof doesn’t distract from the curvature and style of the 2019 MX-5 Miata RF. When it comes to what’s new for 2019, the Mazda MX-5 Miata introduced numerous subtle changes for a better look and driving experience. The Mazda MX-5 Miata offers a tilt/telescoping steering wheel for the first time and the rearview camera is now standard. Also, the soft-top cover now comes in brown along with the traditional black. Want to learn more about the 2019 Mazda MX-5 Miata RF? Contact our staff at Medlin Mazda for more information or to schedule a test drive today!